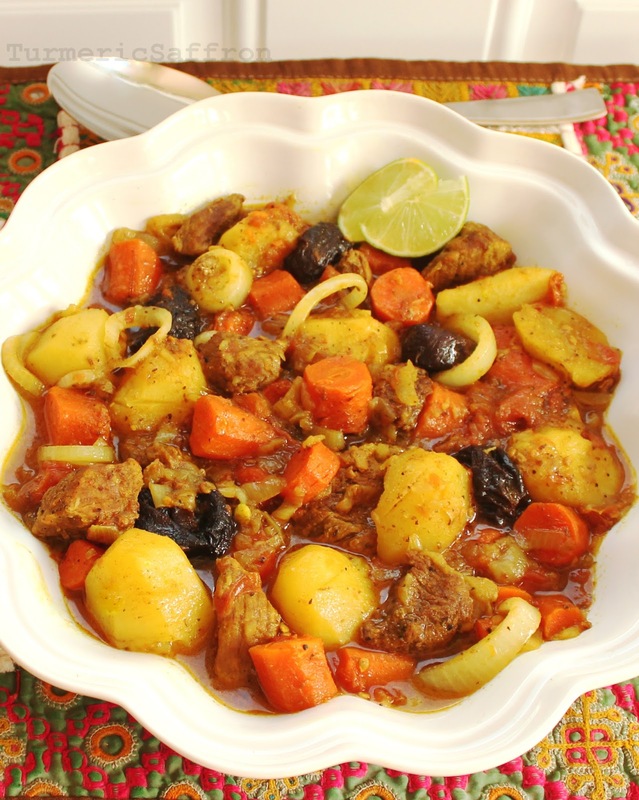 تاس کباب Tas kabab - hearty one pot beef/lamb stew with onions, tomatoes, carrots, quince and potatoes. Tas kabab is usually an autumn/winter meal when quince is in season and readily available in the market. 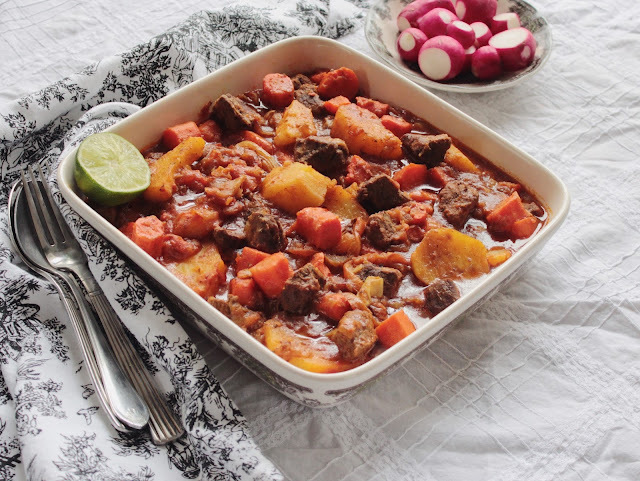 This combination of meat and vegetables is tastiest when made with fresh quince. I like tas kabab very much and I make it frequently regardless of the season. Sometimes, I would use granny smith apples instead of quince. I think it’s a rather good substitute when quince is not seasonally available. 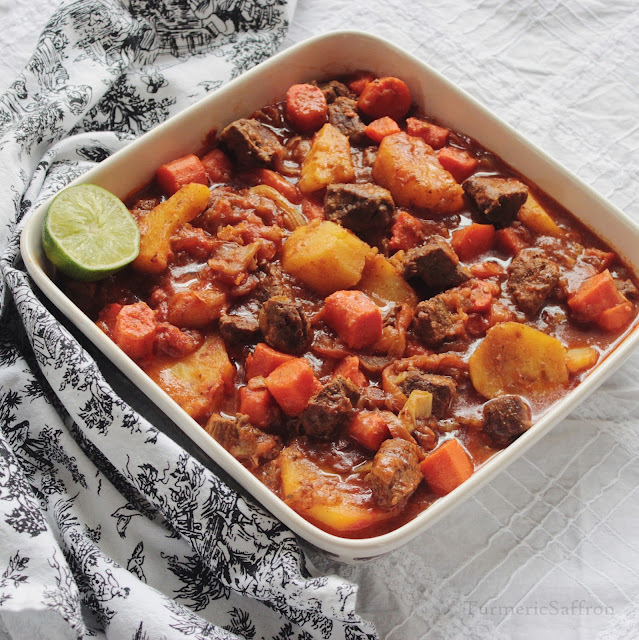 You can make this dish without the use of quince or apples, it would still be delicious. Some people like to add eggplants to this dish. This is an easy and delicious one dish meal and there’s no need to serve rice with it. 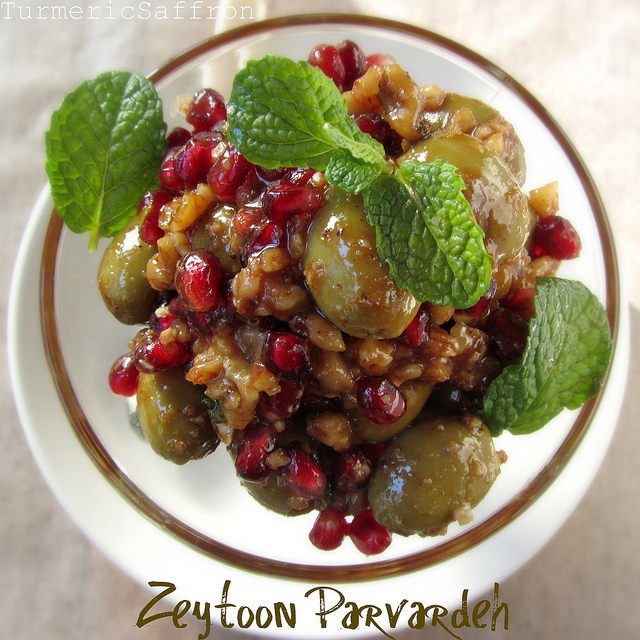 It is best served with some warm bread, yogurt and torshi. In a large heavy pan, heat the oil over medium heat, place a layer of the sliced onions on the bottom of the pan, add the turmeric powder. Add a layer of the meat, add a layer of the sliced tomatoes, carrots, and quince, in that order. As you add each layer, sprinkle them with a dash of salt, pepper, lemon powder and a dash of cinnamon. Add the potatoes and plums. Add 2 cups of water, tomato sauce, cover and cook for one hour over low heat or until the meat and vegetables are tender. Serve on a platter with warm bread, fresh herbs, yogurt and torshi. Tas kabob is probably my fav dish.....I have many, but this one's ranked #1. Can't wait to try your recipe. Cheers! What do you think about subbing butternut squash for quince? I have no quince but have some wonderful cubed squash just waiting to be cooked. Wondering if it might just work?? Valerie, you can substitute the quince with Granny Smith apples and add the butternut squash too. Also I wanted to share another blog with you! Since I know you are a lover of good food, and have a fine appreciation for food and tradition, here is another blog I love, along with yours... for me it is just magical, and the photos are lovely! So for your knowledge in cooking I wanted to give something back to you! p.s. I am also a Francophile, as you could guess! take care! !